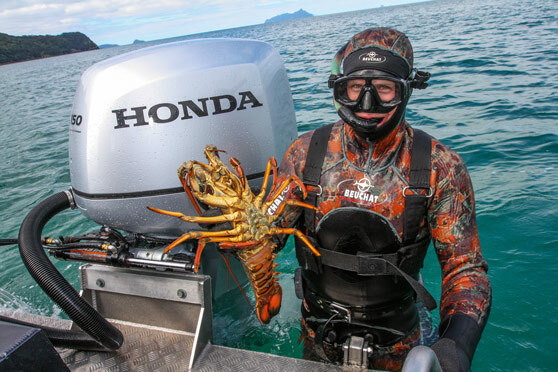 I love it when a plan comes together: an interesting boat to test, some good weather with just enough wind to put some chop on the water, all capped off by coming home with some fresh kaimoana for the table. This proved to be the scenario early in September, when the weather gods finally played ball for the Blackdog Cat review. As we have come to expect from this Whangarei manufacturer, its latest offering was a little different from other models; I’d describe it as quirky and interesting. 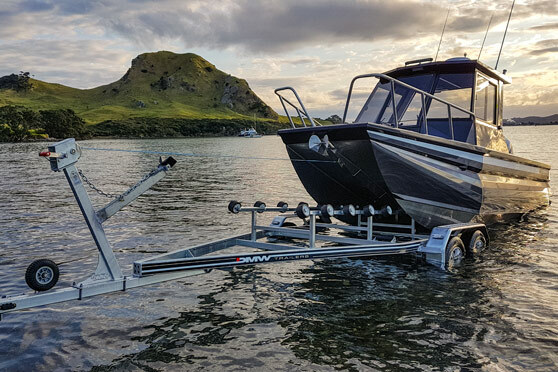 The 6.3 Walkthrough doesn’t fit any particular box, being a catamaran that offers two very different but practical fishing platforms, while the hardtop provides decent shelter. Over the years I have reviewed or been in most Blackdog Cat models, from the very first tiller-steer ‘alloy Thundercat lookalikes’ to the current flagship 6.3 model. The production values have come a long way over the years as the range has become more sophisticated, reflecting a change in company ownership and direction, not to mention client requirements. To be honest, I wouldn’t describe the Blackdog Cat as ‘pretty’: the lines are quite angular and the hardtop is tall for the length of the boat. But from the inside looking out, as the fable relates, the ‘ugly duckling’ transforms into a ‘beautiful swan’ , thanks to the company’s clever and pragmatic approach. For the first big tick, there’s plenty to love from a fishing and diving perspective. One of the most obvious is the Blackdog Cat’s signature feature: the forward casting platform, with the catamaran configuration affording maximum deck space fore and aft. Two anglers can therefore cast away to their heart’s content without interfering with each other’s fishing. Access to the platform is via a unique screen and door system, where the angler makes a short step up from the hardtop to go forward. It is nice and wide (I fit through comfortably!) and there is plenty of height. At the rear is a large, marine-carpeted cockpit that can fish four people with ease – or allow two or three divers to gear up without problem. Catamarans provide plenty of space, and Blackdog Cat has taken full advantage of this attribute. 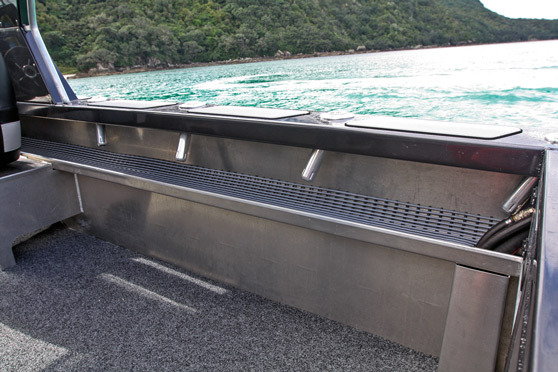 Beneath the casting platform, contained within each pontoon, are two large spaces accessed via hatches from under the dashboard. Fenders, dive bottles and even dive bags can fit in here. A deep glovebox is on the passenger side, large enough to easily take binoculars and bigger cameras. Above it, on top of the dash, is more storage space, with the surrounding hand-holds preventing items from falling on the deck. 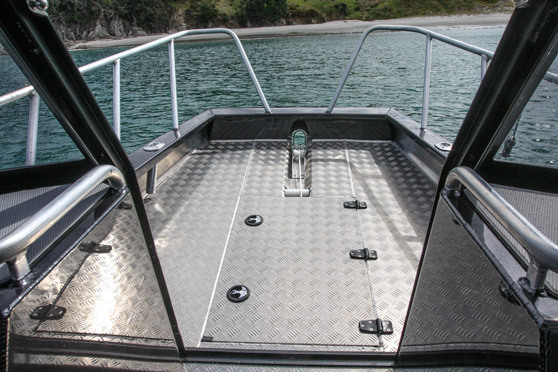 The area is finished in SeaDek, which provides a non-slip surface; SeaDek is also used throughout the boat to provide good grip and protection where required. Blackdog Cat’s Luke Ogle says he has been very impressed with this product, not only for its practicality, but also the 125,000simplicity of application. “We provide the drawing file, and they [Batavian Rubber Company] cut it out using CadCam and a router system, sending it back to us to fit-up,” Luke says. There is plenty of height to the lined hardtop, which will obviously suit some customers, although I’d consider getting them to drop it a few centimetres if ordering this boat myself. The helm station is well laid out and the view is excellent. At the heart of the electronics is a Simrad Evo III nine-inch chart-plotter/sounder, linked to the Simrad 4G radar. A Garmin GMI 20 engine-management system gives the helmsman all the info required, interfacing with the Honda BF 150 V-TEC four-stroke outboard bolted to the transom. A Simrad RS12 VHF provides the communication. The helm and passenger seating is provided by BLA; there is a handy flip-up bolster on the skipper’s seat for support when driving from a standing position. Another neat feature is the way Blackdog Cat has incorporated the helm-operated SavWinch 1000 under the casting platform, with the bulkhead strengthened to handle the drum-winch unit bolted to it. Access is via a floor hatch, with the anchor warp and chain exiting onto the fairlead – very neat and tidy. There is no shortage of rod holders: there are six in the rocket launcher, eight around the gunwales (set up for trolling), and a further four in the casting platform’s gunwales. Also set in the transom, raised as high as possible, are the house and start batteries, accessed via a large hatch. Blackdog Cat has set the battery breakers and switches into their own sealed area – handily placed, but still well protected. A wash-down hose lives in the shelving, and the stern cleats are placed on the transom, as opposed to on the gunwales, to keep the working area clear of obstructions. A deep sump in each cockpit corner, complete with a TC bilge pump, collects any excess water and associated bait scraps. The as-yet-to-be-named vessel is owned by Luke and Jonny’s dad Kevin, a partner in the business. 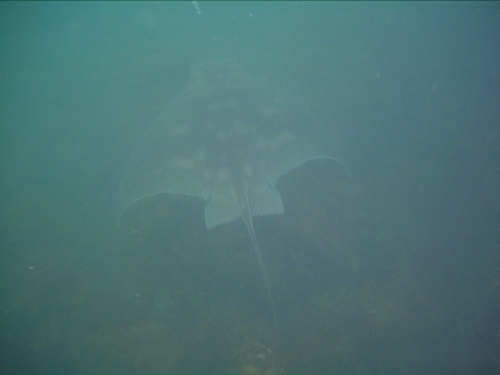 While diving and bottom fishing are the main pursuits, the boat will also be used for game fishing. To this end, there are 55-litre fuel tanks set into each pontoon, allowing Kevin a decent range, given the economy offered by the Honda. It is possible to fit 100-litre tanks each side. The vessel is extremely well lit, courtesy of Hella’s latest Sea Hawk XLB spot and Sea Hawk-R floodlights and cabin lights. 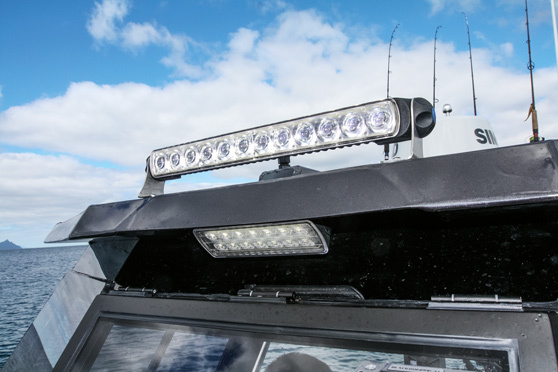 Luke says these are high-output lights that draw minimal power, which is important in a smaller craft with limited battery capacity. Both the foredeck and cockpit fishing spaces are floodlit, with the spotlight facing forward. BLA supplied the OceanLED blue underwater lights mounted on the stern. These are useful for attracting bait at night and reflect off the propeller when game fishing, which is said to replicate the flash created by a school of fish. Last, but not least, is the DMW custom-built tandem-braked trailer. “Obviously catamaran trailers need to be configured differently from conventional boat trailers. DMW has done a great job for us, and it tows particularly well,” Luke says. Performance-wise, there is a lot to love about this Blackdog Cat. While not particularly rough that day, there was enough chop coming back from the Hen and Chicken Islands to give a feel for its rough-water capability and all the indications were good. Steering was comfortable with no ‘ torque return’, courtesy of the SeaStar hydraulic steering. The boat runs quite dry, and while it takes a little while to get used to helming a catamaran after a monohull, it is a difficult boat to trip up. At rest, it is a particularly stable vessel, making for a good fishing platform – no wonder I like it! 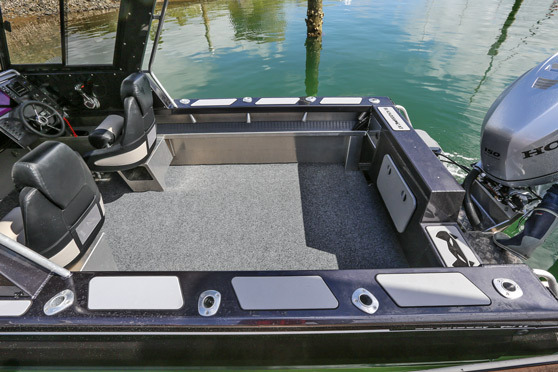 As well as the Walkthrough model, the 6.3 can be configured as a hard-top without the casting platform, a cuddy cabin, or a centre console. 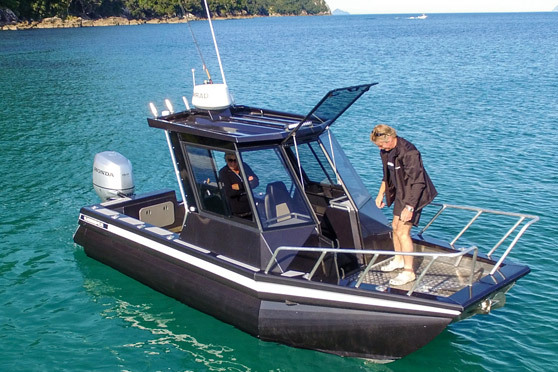 Blackdog Cat is also developing a twin-outboard model, at the behest of its growing number of Australian customers.